Weekend mornings allow for a a royal breakfast! 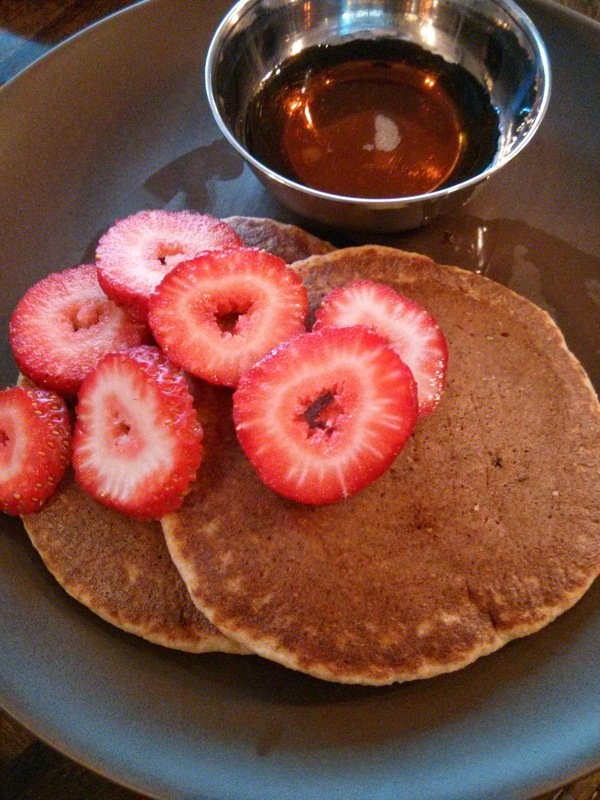 Here are our favorite Banana Oat Pancakes with homemade strawberry sauce (sweetened with date syrup). These pancakes are made without any oil and are super heart-healthy (and gluten-free if you use gluten-free oats). Warm a non-stick skillet. Put all ingredients in blender and blend JUST until smooth. DO NOT overblend. Cook on medium heat until bubbles start to form. Flip the cakes over and cook until golden brown. Serve immediately or keep warm in oven or toaster oven until ready to serve. Serve with 100% real maple syrup or homemade fruit syrup. Yum! I'd love your strawberry date sauce recipe! Simply blend 3-4 pitted medjool dates with water (syrup consistency) and cook that mixture with about 2 cups of strawberries in a saucepan until they cook down. Serve over pancakes or waffles!